Day before yesterday what I had written about gold? If you forget then click here to read it again. Yesterday Gold touched our all targets and I hope from this free tips you all earned Rs.21,000 per lot! Subscribe our service for read more continue about MCX and COMEX Gold! 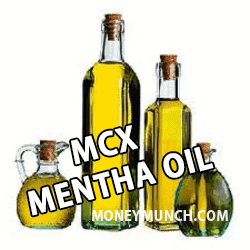 Day before yesterday I sent in email had not only updated about Gold because there were also included MCX Mentha oil. Do you remember that or forget? If you really forget that then ‘click here‘ and remind it again. Yesterday it had crossed 967 level and went down upto 953.4 level so according to my update it first 2 targets has been achieved successfully and 3rd target is touched today! I hope every small investor should have taken earned well money from this call.